International Business Machines Corp (NYSE:IBM) isn’t benefiting from the current cryptocurrency craze, but it should be. Apart from IBM stock, seemingly every stock with a whiff of blockchain, bitcoin or cryptocurrency has been on fire over the past few months. IBM stock has found its stride in 2018, climbing 7%. That’s outpacing Facebook Inc (NASDAQ:FB) and Alphabet Inc (NASDAQ:GOOGL, NASDAQ:GOOG) and on pace with Amazon.com, Inc. (NASDAQ:AMZN). But it’s not seeing nearly the same love that other blockchain related stocks are. Those who have been following the cryptocurrency mania have seen just how wild of a ride it’s been. Riot Blockchain Inc (NASDAQ:RIOT) shares went soaring when this biotech company changed its name. Long Island Iced Tea Corp changed its name to Long Blockchain Corp (NASDAQ:LBCC) and saw its stock explode. Heck, Eastman Kodak Company (NYSE:KODK) tripled — yes, tripled! — in the few days after announcing KODAKcoin and blockchain plans. I mean, it’s getting to the point where this is just ridiculous. That’s why in mid-December I said IBM deserves to be a part of the blockchain party. And no, not by changing its name to IBM Blockchain Corp. In all seriousness, IBM is working with different ways to implement blockchain technology. While many have criticized bitcoin, ethereum and other cryptocurrencies, most have been positive on the underlying technology, that being blockchain. Applications for blockchain range from financial institutions, to logistics operators, to supply chains. There are a vast amount of industries in between that blockchain can make more efficient as well. However, despite the company looking to leverage this technology, IBM has gotten almost no love from investors — until this year. To be fair, many of these stocks have market caps below $1 billion. A few — like The Crypto Company (OTCMKTS:CRCW) and Longfin Corp (NASDAQ:LFIN) — eclipse the mark. But none come close to the $152 billion market cap of IBM stock. It’s certainly harder to move a behemoth like this vs. a thinly traded over-the-counter stock that changes its name to the hottest trend in finance. While we have been pointing out IBM’s exposure to blockchain for quite a while now, investors may finally be buying in. Of course, it could be the fact that IBM stock pays a 3.7% dividend yield and trades at 11.8 times forward earnings estimates. But that “catalyst” has always been there. Further, analysts forecast sales growth of — gasp! — 1.4% this quarter, which would snap its ridiculous streak of 22 consecutive quarters of revenue decline. If that’s the case, maybe that’s all IBM stock really needs to regain some mojo. Despite IBM working in some of the hottest growth markets in tech, the company’s top and bottom line results have very little to show for it. Work in closed cloud computing and artificial intelligence (via Watson) has yielded surprisingly slow-growth results. That’s despite the absolute massive growth we’ve seen in others, like Microsoft Corporation (NASDAQ:MSFT), Amazon and Alibaba Group Holding Ltd (NYSE:BABA). The point is, does IBM working with blockchain even matter? On paper, it should. As seemingly every company — from biotech to iced tea — has soared on its dabbling of the technology. But IBM is one of the few companies that could actually leverage blockchain in an incredibly meaningful way. It can deploy blockchain applications domestically and overseas, scaling over many different industries. Optimistically speaking, over the next few years A.I. and blockchain could slingshot IBM back on a path to its glory days. Pessimistically speaking — or realistically, depending on who you ask — IBM has whiffed on most major growth opportunities over the last five years. It’s seen quarterly year-over-year revenue sink for 22 consecutive quarters. Why would they finally get this one right? I wouldn’t go all-in on IBM finally figuring out how to grow sales. But one could do worse than buying IBM stock with a sub-12 forward price-to-earnings ratio and a near-4% dividend yield. The recent surge in IBM stock this year has vaulted it over a significant level. In October, IBM’s post-earnings rally sent it to $160, where it promptly failed and traded lower. Now at $164 though, IBM stock could challenge its early-2017 highs near $177. 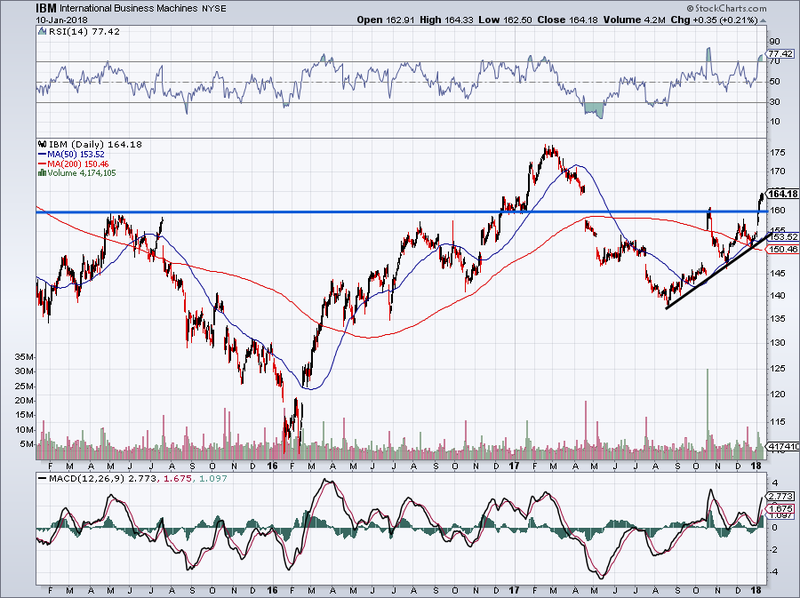 I must also point out the uptrend (black line) IBM stock has been forming since late-summer. Investors could also consider buying on a retest of this trend. IBM is far from a tech-stud. But its low valuation, high yield and potential for growth make it a stock to at least consider. 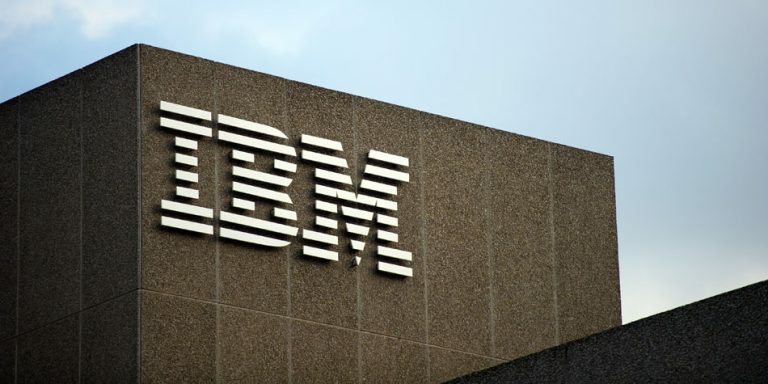 Article printed from InvestorPlace Media, https://investorplace.com/2018/01/buy-ibm-stock-for-blockchain/.